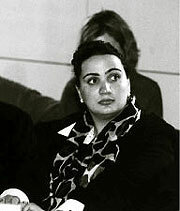 Shukria Barakzai, founder and editor of Afghanistan's first women's magazine (Photo: Deutsche Siftung für Internationale Entwicklung). Since 1975, World Press has presented its International Editor of the Year award to an editor outside the United States in recognition of enterprise, courage and leadership in advancing the freedom and responsibility of the press, enhancing human rights and fostering excellence in journalism. Our editors, in consultation with our correspondents, translators, contributing editors and other leading internationalists, overwhelmingly selected Shukria Barakzai, Kabul-based editor of Aina-E-Zan (Women's Mirror), as the winner of the 2004 award. Mrs. Barakzai exemplified the best of what the Editor of the Year award seeks to honor. Mrs. Barakzai is the editor-in-chief and founder of Aina-E-Zan (Women's Mirror), a weekly newspaper based in Kabul, Afghanistan. The newspaper was launched in 2002 "to improve the understanding and knowledge of Afghan women in our society," says Mrs. Barakzai. During the Taliban regime, women were forbidden to work or study outside the home, but now Afghan women are re-entering public life, and often leading the charge for greater civil liberties, equality and press freedom, thanks in part to the efforts of Mrs. Barakzai. Women's Mirror, which is distributed for free, attempts to maintain unbiased and independent reporting in an atmosphere where the legacy of state censorship is still very evident. The purpose of the newspaper is to increase Afghan women's awareness of political, social and cultural issues. The newspaper has a current circulation of 3,000 copies per week in 12 provinces, and features articles on major news events, education, health, human rights issues and civil society. It is published in Afghanistan's two official languages, Pashto and Dari. Pursuing freedom of expression, women's rights, and education for women and girls in a country undergoing radical transition has proved a major test for Mrs. Barakzai. Economic hardship, domestic violence, lack of education, and security instability remain daunting problems for Afghan citizens, particularly women. Despite these obstacles, Mrs. Barakzai has been a major advocate for those who have been denied a public voice. Mrs. Barakzai has courageously asked questions about corruption and accountability in the post-Taliban era. Mrs. Barakzai has long been a proponent of education for women. She organized and funded secret women's schools throughout the Taliban regime at great risk to her life. When the Taliban came to power, Mrs. Barakzai's parents and her six siblings fled the country. Forced to abandon her studies in geophysics at the University of Kabul, Mrs. Barakzai vowed to defy the newly imposed rigid restrictions on women and, from the confinement of her home, headed several underground schools. Now over three million children – nearly a third of them girls – attend schools in Afghanistan, thanks in part to Mrs. Barakzai's untiring, trailblazing efforts. "The situation for Afghan women has improved dramatically since the Taliban fell," she said, "and the future is brighter than ever." Mrs. Barakzai says that what is now required for women, including those less educated in rural areas, is to coordinate a united campaign against the continuing suffering of all Afghan women. In addition to her work in education and at Women's Mirror, Mrs. Barakzai was a member of Afghanistan's Constitutional Reviewing Commission. Nominated by President Hamid Karzai to this job, she worked for more than nine months reviewing each article of Afghanistan's Constitutional principles draft. Although her work on the Commission has ended, the 500-member grand council, or Loya Jirga, adopted the new post-conflict Afghan constitution in early January 2004. Under article 22, it states that every Afghan citizen, whether male or female, has equal rights and responsibilities before the law. Many women have called the constitution no less than a miracle in a country once dominated by conservative leaders and traditions. For Mrs. Barakzai, it is the first and most crucial step in gaining women's rights in the long term. Mrs. Barakzai's work does not stop there. She is the president and founder of Asia Women Organization (AWO), which is a local humanitarian and non-profit NGO. Her aid agency Asia, which funds Women's Mirror, created secret schools during the Taliban regime, and continues them in the open today – teaching more than 150 girls around Kabul. Mrs. Barakzai is at the center of political debates in the Afghan and international media and is instrumental in preparing Afghanistan for its future. She remains hopeful that the United Nations, the international community, and Afghanistan's own burgeoning civil society will continue to encourage the participation of women in social and political spheres within Afghanistan. Women's Mirror is a vanguard publication of these efforts, written by Afghan women for Afghan women. The work that lies ahead of Mrs. Barakzai is daunting, yet the progress she has already made is incredibly inspiring. In times of great change, Mrs. Barakzai has demonstrated a constant dedication to press freedom and greater opportunities for Afghan women and girls. Mrs. Barakzai earned our congratulations by being named Worldpress.org's 2004 International Editor of the Year – for her incredible courage, inspiring work, and tireless efforts to change the course of history for women in Afghanistan.